Red Star Brands is a company based in the UK, known for its collaboration and partnership with companies that challenge the norms in the food and beverage industry. One of their newest brands addition is JUST water, launched by Jaden Smith, the son of American actor Will Smith. 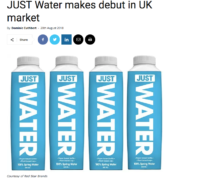 JUST water, since its launch in 2015, has become the number-one selling water bottle in its category. What’s interesting about this brand is it’s ethical and ecological approach, it provides their consumers with a product that uses 82% plant-based renewable materials in their packaging. The brand uses the consumer concerns and developed a product that addressed these issues.